Quiltville's Quips & Snips!! : Galaxy-Gram! While Bonnie Waits in Charlotte! It was fairly rainy, drizzly and cold when I left Columbia, South Carolina for Charlotte, North Carolina this morning. Jason had to be to work by 10 a.m. 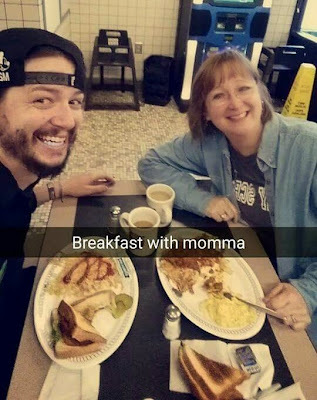 So we grabbed a quick breakfast together at his favorite Waffle House. I so love spending time with my grown up children! 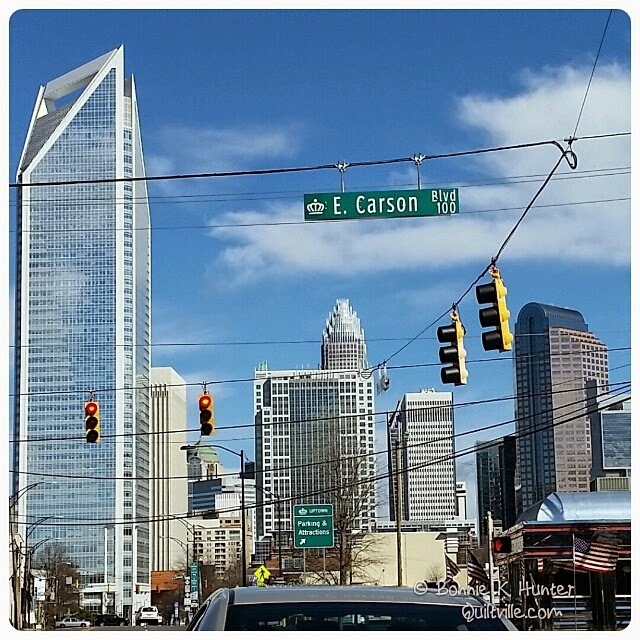 By the time I got to Charlotte, the rain had stopped, the clouds had cleared, and the Sun had come out to play in a beautiful Carolina blue sky. I stopped to get Shamu a much needed car wash! I wandered an antique mall to take up more time while waiting for Randy and Lori to arrive. I found my birthday presents! Or should I say more birthday presents!? 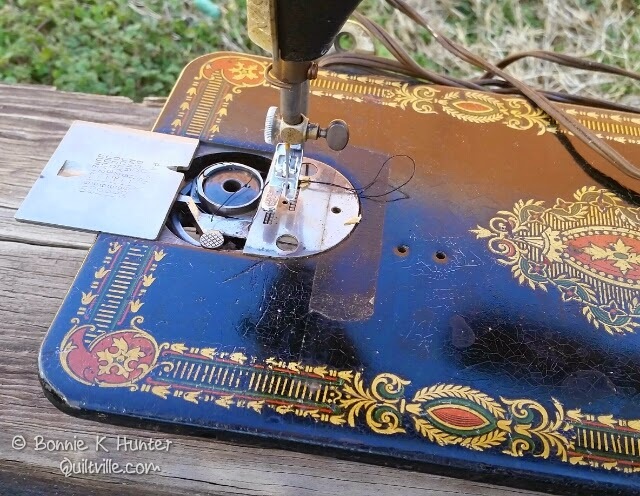 How can a vintage machine loving girl walk away from a 1917 singer 66 treadle head? The handwheel moves so freely, and it won't take much at all to remove the added on electric light, and the cabinet hinges left from ripping her out of some other cabinet, and fit her into one of my existing cabinets. Her decals are in great shape though there is some cracking and crazing of the clear coat. 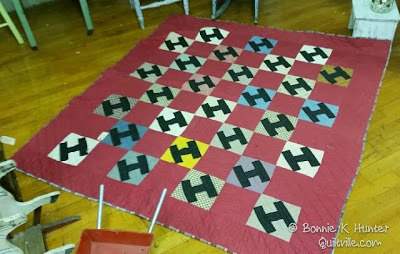 And then I turned the corner to find an antique quilt covered in "H" blocks! I couldn't leave this behind either, because "H" is not only for Hunter, but for the HAPPINESS I feel every time I head up to that little cabin in the mountains, Quilt Villa! As soon as this sounds I am leaving the parking lot of the antique mall and heading to the airport to pick up my friends! A belated happy birthday to you from Sweden. Love your new machine, she looks beautiful, even with the cracking. Beautiful decals. I would have snatched her up too for that price (although I don't know how I would have gotten her over to Sweden). And the quilt looks great too. I hope you have a wonderful sewing week with Lori and Randy. Wow, two terrific finds. The machine is beautiful! Happy Birthday! So glad you had time to spend with your son. That's one of my favorite things as well! Have a great sewing week! That quilt was meant to go and live at QuiltVilla! 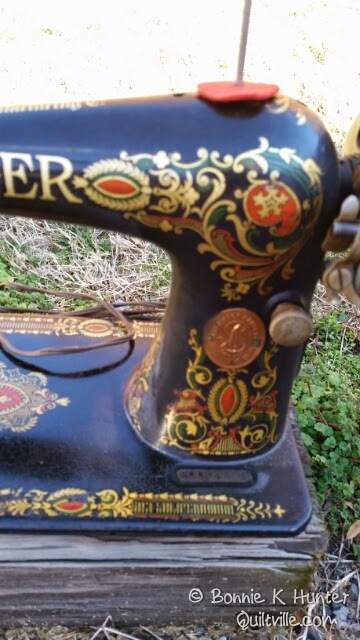 What a find, plus another Treadle head. 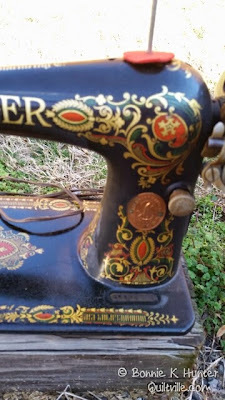 I'm so green with Treadle envy! Tell Lori and Randy HI! What antique mall did you go to in Charlotte? Either you have a better eye for finding things than I do or you have found an antique place that I have not found! The new machine is just gorgeous Bonnie. Happy Birthday again. Two great finds! Happy Birthday again! My personal favorite, picking out my own presents! O Happy Day! Good for you, Bonnie! I love the Happy quilt and that gorgeous machine. You and I would be dangerous together. :-) I am so happy for you, dear heart. Happy Birthday! Eat more cake! Happy Birthday to you. 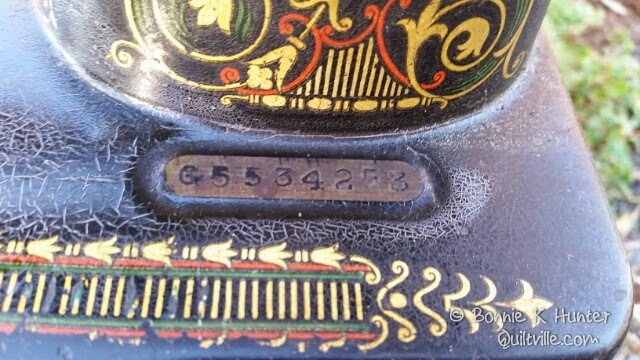 Someone posted to use peanut butter to take the tape marks off and not damage the decals, which a beautiful. 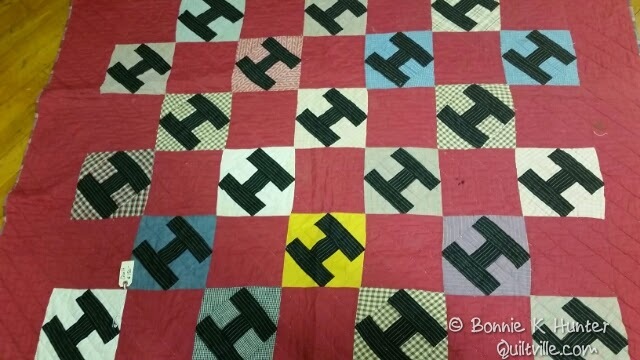 Now the H quilt looks like I's to me. 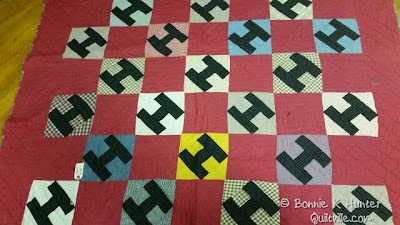 You find some very unique quilts. Beautiful and unique. Keep smiling. You are a blessing to lots of us that love to see your smile and your kindness. Beautiful, Bonnie! How do you find these things? I want to find a nice singer treadle in excellent shape! You Rock my Dear!! My goodness you are so lucky and blessed at the same time! 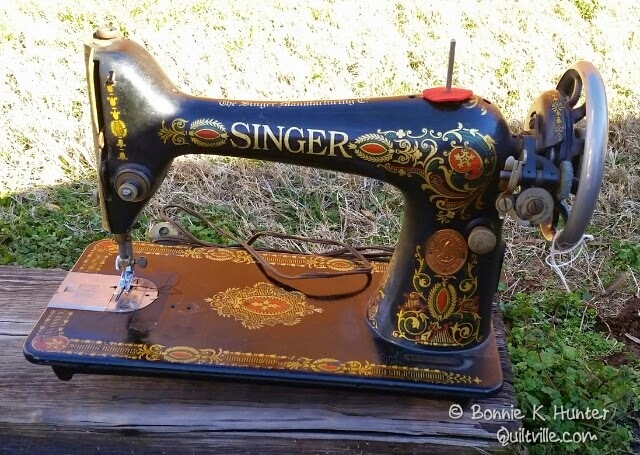 Find me an ok Featherweight for around $150.00 and I would be ecstatic!!! I hope you were blessed even more by your husband and friends that came to play.